Senate President Pro Tempore Tim Ashe and House Speaker Mitzi Johnson confer before Wednesday's press conference as Senate Majority Leader Becca Balint (center) looks on. 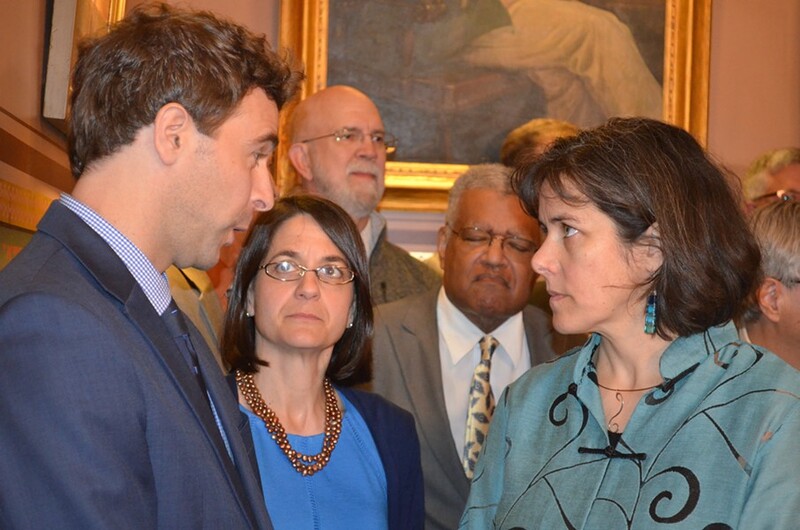 After more than a dozen meetings and multiple counterproposals, Vermont House Speaker Mitzi Johnson (D-South Hero) and Senate President Pro Tempore Tim Ashe (D/P-Chittenden) announced Wednesday that they’re done trying to win Republican Gov. 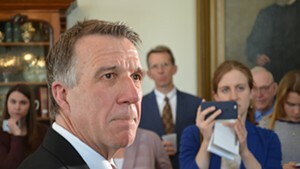 Phil Scott’s support for a compromise plan to save money on teachers’ health insurance. The announcement came less than two hours after Scott, Johnson and Ashe met privately in the speaker’s office. After saying he was open to any proposal that would lead to health insurance savings, Scott has rejected several legislative plans that met that goal but didn’t do so through a statewide contract, as he originally proposed. “I think this wasn’t ever, at its heart, about saving the taxpayers money. 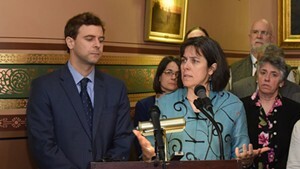 It was about really undermining those local conversations and working Vermonters,” Johnson said, referring to the collective bargaining that currently occurs at the school-district level. So what now? The Senate and House will hash out an agreement between both chambers, pass a budget and see if Scott follows through on his veto threat. If he does, the legislature will likely reconvene in June to once again try to pass something palatable to the governor. Not for the first time, Ashe criticized Scott for introducing a significant proposal just two weeks before the legislature was supposed to adjourn. “The reason we’re here now still struggling to find resolution is that this very dramatic proposal was dropped with literally days left in the session,” he said.